MEN'S NAVY BLUE JACKET BARBOUR HERITAGE LIDDESDALE QUILT (SMALL). Condition is Used. Dispatched with Royal Mail 2nd Class. Barbour Border Wax Jacket. (see photos). Wax is organic and will require an antibacterial wash regularly as Wax is prone to picking up mold spores and can give off odours. May have signs of wear and marks. Style: A170 Burghley. The Burghley coat is a 6oz waxed cotton long coat with a corduroy collar. There are two flapped bellow pockets and a zipped wallet pocket. The Burghley jacket is compatible with the press-stud hood (not supplied). Construcción acolchado. Material Polyester. -Hoyo a hoyo es 25". Color Blue. Style Basic Jacket. Cuidados: Lavado a máquina. Materiales: Exterior 100% poliamida, interior 100% poliéster. Ajuste 100% algodón. Mens Barbour ‘Camber Casual’ Jacket MCA0428 NY71 in great condition. Size Large. Hardly worn and expensive when new. Please see photos. Full clean Barbour tartan lining. 2 large Barbour press stud bellow pockets. 2 very large removable Barbour press stud poachers pockets. Kindly view Barbour size chart for fit. Cord collar with throat strap. 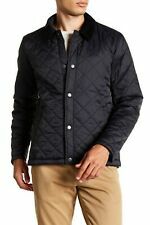 Diamond quilted polyester outer. Front double zip and popper fastening, 2 poppered slip pockets, 1 zip pocket. Corduroy neckline. This jacket is in VERY GOOD USED CONDITION. A small amount of creasing across jacket. The front is secured by a Barbour logo poppers. This super lightweight jacket has had light wear and is in reasonable condition except for a couple of very small holes as can be seen in the photos. A lovely comfortable jacket 22" pit to pit, in used but very good clean condition, any questions please ask. Barbour Polar Quilt Jacket Small Long. Condition is Used. Dispatched with eBay delivery – Shutl 1 day. You are buying a Barbour International Impeller Quilted lightweight Jacket with a defect. RRP 149.00. Constructed in a slim quilted silhouette filled with fiber down, this Impeller jacket from Barbour International is a streamlined and lightweight cover-up. Barbour "Durham" Jacket 23" pecho azul oscuro/gris pizarra Hue. Barbour Jacket 23" Chest (No Size Label inside) DarkBlue/Slate Grey Hue. Slight Fade-Mark on Back, Otherwise Great Condition. BARBOUR BEDALE FOUR POCKET WITH CORD COLLAR AND TARTAN LINING. BARBOUR THORNPROOF IN NAVY BLUE. Storm fly front. Brass finish. THIS IS A USED/SECONDHAND ITEM. SIZE READS: 30"/76 CM. Pure cotton tartan lining. Marke Barbour. Chaqueta Chaquetas de los hombres. Nuevo con las etiquetas. Muster kariert. EAN Nicht zutreffend. Verschluss Knöpfe. Textilpflege Nur chemische Reinigung. Stil Sakkos. Barbour Bedale Waxed Jacket. Jacket is inGOOD condition - Hood lining has slight colour fading, very minor wear to cuff edges. Zip fastening at front with press stud storm flap. Navy blue colourway. Ltd Use/Unmarked! Feature: Unmarked Blue Tartan inside Lining - see pic 2. Colour: Navy Blue. Condition: Ltd Use/Unmarked. ClassicBarbour label on inside lining for authentication - see pic 4. Composition: 100% Nylon - see inside label pic 4. Barbour rambler field jacket in navy. Barbour bedale 46-Azul Marino-Excelente Estado Y mejor que la mayoría. BARBOUR BEDALE. IN NAVY BLUE. THIS IS A REALLY CLASSY COAT IN EXCELLENT. Diamond quilted polyester outer. Front double zip and popper fastening, 2 poppered slip pockets, 1 zip pocket. Corduroy neckline. GOOD: A moderate amount of wear evident from normal wear and tear over the jacket's life. Chest Size 38R. Extra-special finishing touches are provided by the tonal felt under-collar, and the large-scale version of Barbour's iconic Dress tartan that trims the lining. Barbour Sum Tailored Jacket. Barbour Jacket, Navy, XXL. Only worn a couple of times, in as new condition! Cost over £200 new! Barbour Border wax jacket. (see photos). Wax is organic and will require an antibacterial wash regularly as Wax is prone to picking up mold spores and can give off odours. Navy Blue. (see photos). Wax is organic and will require an antibacterial wash regularly as Wax is prone to picking up mold spores and can give off odours. LEVIS 501's. Barbour UK. Two-way front zip fastened with poppers - all of which are Barbour embossed. Stud fastened side vents at hem (Again studs are Barbour embossed). Short Length Quilted Jacket. Two small pulls in the diamond stitching at the rear hem. For sale is a Barbour Jacket: Brand: Barbour Style: Squire Colour: Navy Size: M Condition: Used but in excellent condition having only been worn a handful of times RRP: £160 The Barbour Squire Casual Jacket comes complete with two lower bellowed pockets and two hand warmer pockets for cooler days. A classic cord Barbour collar gives this versatile jacket that classic country look, while the tartan lined throat strap plays homage to Barbour's Scottish roots. This item is unlined with bound seams to keep it lightweight and breathable in warmer weather and is finished with a dual zip and press stud closure. Please feel free to ask any questions. Concealed hood. In good condition. Rest of World: £21.99. Se trata de un Barbour azul marino Lomond chaqueta de algodón encerado en tamaño grande. Material Waxed Cotton. Color Blue. Style Utility. Punto limpio. 100% ALGODÓN. Blue with chord collar. Condition is Used. SELECT 'READ MORE' FOR MORE PHOTOS & FULL DETAILS. Barbour Bedale Blue Wax Jacket size 91Cm/36In. IF THE HOOD OR LINER IS VISIBLE IN THE PHOTOS, IT WILL BE INCLUDED. Shoulder to bottom: 28". Pit to cuff: 17". This is a classic authentic Barbour Bedale wax jacket with all the expected features and careful design.The jacket is equally suited to outdoor pursuits as much as it is paired with jeans for casual wear.